This is a simple and quick meal for anyone who doesn't feel like doing a lot of cooking, or is in a hurry. It's also pretty cheap, great for college students who are strapped for cash! 1. Set oven to Broil (or high heat if you don't have broil) and throw 4 pieces of bread in. 1. While bread is toasting (3 minutes or so), drain the juices out of the can of tuna, add it to the bowl. 2. Add pepper, salt, lemon juice, hot sauce and light mayo to the bowl and mix. 3. Take bread out of the oven, lay two of the pieces of bread on tin foil, put the tuna mixture on top of each piece, and layer the cheese on top of the tuna on each piece. 4. 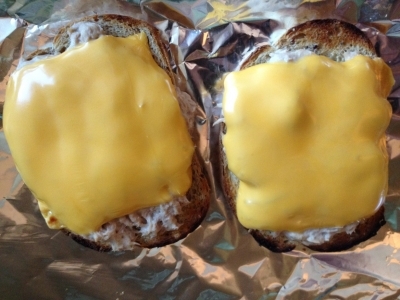 Return to oven and let broil for 2-3 minutes until the cheese melts. 5. Plate and put your other piece of bread on top. Serve and enjoy!